Located in a park full of trees by the Grand Canal River on the east side of Beijing, the project started without a clearly defined program. The client visioned the space to be flexible for different functions (restaurant, bars, event space, gallery, office, etc.). 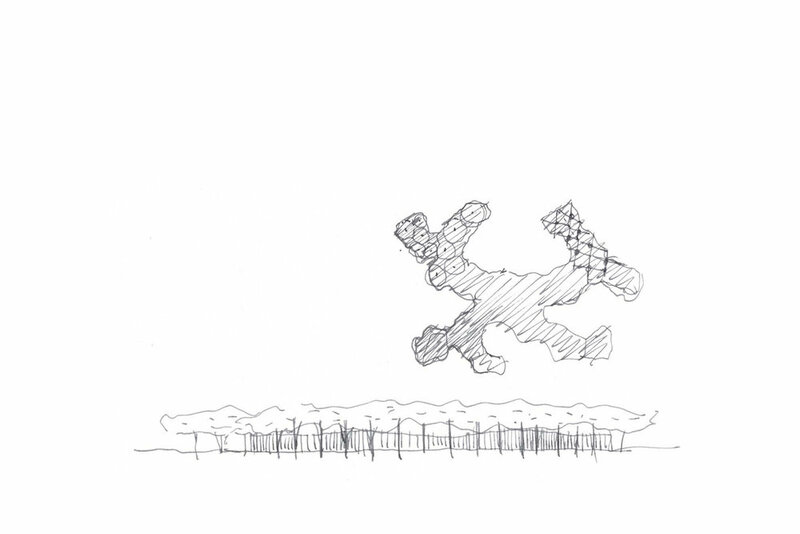 Inspired by No-stop city, a utopian urban design proposed by Archizoom in 1960s based on indeterminism, Forest Building explores a spatial system generated from additive units responding to the uncertainty of program, as well as structural form and construction system responding to the character of the site. 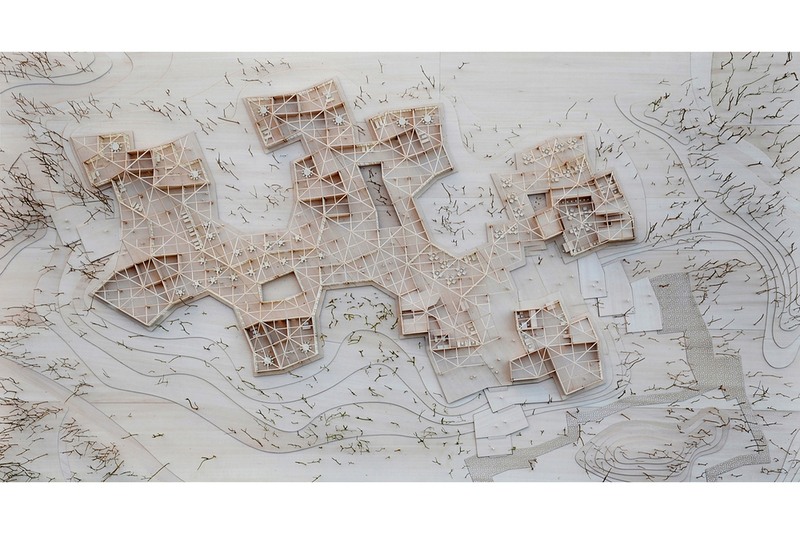 When the program doesn’t give much to initiate the design, the architects examined the site to find a starting point to capture the sense of place. The river and the trees were the strongest character of the site, so the idea started to emerge: to create a place where people can sit under the tree and enjoy the view of the river—just like what everyone does in a park, even without architecture. This became the beginning point. Consequently, a base unit was developed. By organizing it in a grid system, there generates the overall form. Later on, the structure, material, landscape, mechanical system, drainage, all these elements are conceived and developed following the original intention. The structure is made from the repetition of a basic unit, a tree like column with four cantilevered beams at varied heights. 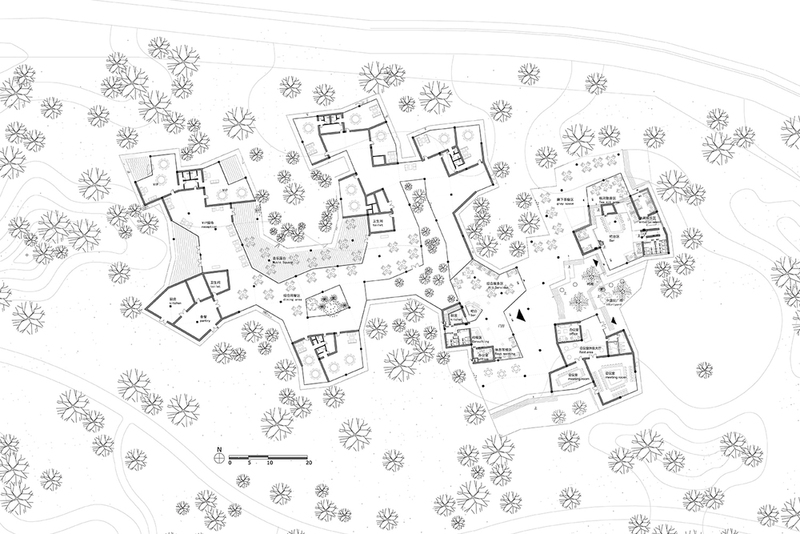 The plan is based on a grid system that is flexible enough to adapt to the site and existing trees. Such flexibility also makes it possible to break down construction into a number of phases. The structure is elevated by a floating concrete platform, which protects the glulam structure from moisture. At the same time, the utilities run underneath the concrete floor so that the wood ceiling is free to express the structure and space purely. The architecture is mainly constructed from glue laminated wood and rammed earth. These natural materials could adjust the relative humidity and temperature of indoor and outdoor areas, and will biodegrade in the future. Clear glass windows fill in the space between wood columns and rammed earth walls, inviting people inside to experience the manmade forest and the natural forest outside at the same time. Client: Beijing Meijingtiancheng Investment Co., Ltd.